Chances are there are a number of things you’ll want to know in the morning before you start your day. They might include the weather, the latest news or any reminders you’ve set for the day, among other things. With Clockwise Smart Alarm you can hear all these things as soon as you wake up. 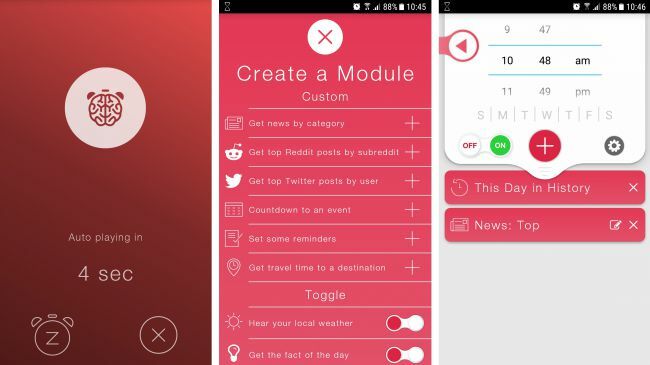 Simply set an alarm time and customize what things you want to hear, with the selection also including a fact about this day in history, a daily quote, Reddit or Twitter posts, the travel time to a custom destination and a countdown to an event. Then when your alarm goes off it will start by making a loud alarm sound (of your choosing) to make sure you wake up, before either automatically reading out various information from the selection above, or doing so when you tap ‘play’. You can also choose from a wide range of male or female voices to read things out, set multiple alarms and choose which content you want each alarm to read. With options like customizable volumes and snooze lengths, Clockwise Smart Alarm handles the basics well, while also offering far more than a typical alarm clock. The free version of Clockwise Smart Alarm limits you to three different types of content (called ‘modules’) for any one alarm, but a single IAP of $0.99/£0.89 lets you unlock unlimited modules, unlimited alarms and removes adverts, which is probably worth it if you start using this your main alarm clock.